Best Camera Apps: Best NASA Videos Ever! Using the Helium 8K high definition (UHD) video camera by RED, NASA just released the first ever 8k video from space. Imagine if this was available for the Moon landings. The first steps on Mars should be incredible, like being there. RED is a digital cinema company. These 8K videos are specifically 8192 x 4320 pixels. The RED camera is the same brand used to record The Hobbit trilogy, Guardians of the Galaxy Volume 2, and television programs like Lost in Space. The original video is available from HERE. But be warned, the vid is over three gigabytes. And good luck finding an 8K display to view it. But imagine future Virtual Reality with a resolution so high that you cannot tell the difference between virtual and real. #BaseReality. These awesome 8k displays are coming though. Samsung demonstrated a TV using artificial intelligence to upscale 4K to 8K. It's not real 8K, but it's close. Sony has a prototype TV with true 8K resolution. Now the good news. Sharp is shipping a 70-inch 8K Television in Europe. The cost is around $14,000 US dollars. Sharp apparently colluded with RED to design and build their TV. Smaller screen TVs do already have 8k, but what's the point? With a 32 inch display, you cannot experience the magic of real life 8k. 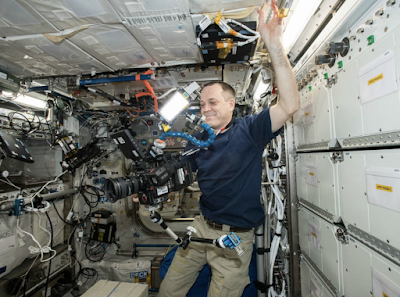 Below is NASA astronaut Ricky Arnold shooting on the International Space Station.